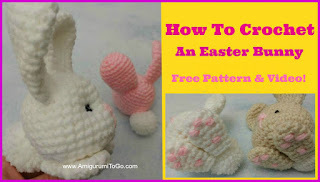 On this page you will find the video tutorial for the small Easter Bunny pattern I released the other day. The written pattern is here. Even if you never crocheted before! This is a video series for the complete beginner. Part 1: I walk you through each row of the bunny body, how to increase, decrease, how to stuff and shape. Part 2: How to add in the face. Part 3: How to start the legs and ears and how to add in the toe pads. Part 4 will go over making the tail and the final assembly. I hope you enjoy!